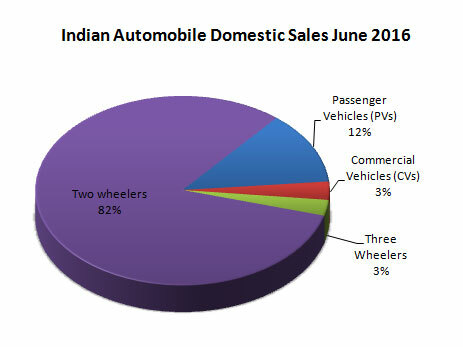 According to the Society of Indian Automobile Manufacturers (SIAM) released data for the month of June 2016 the Indian automobile industry domestic witnessed a double digit sales growth of 10.70% over the same period last year. It was backed by overall positive growth across all the segments of automobiles and was pushed by the good double digit growth in domestic sales of two wheelers and three wheelers segments. The automobile production figures showed a better growth rate of 12.70% for the month of June backed by some healthy double digit production growth in commercial vehicles and three wheelers segments. The exports however registered a decline of 10.70% for the same period. The Indian Passenger Vehicles as a segment recorded the lowest growth of 2.68% for the month of June 2016 over the same period last year. Passenger Cars sales went into negative registering a decline of 5.18% in domestic sales, as did the Vans segment with declining sales of 2.16%. 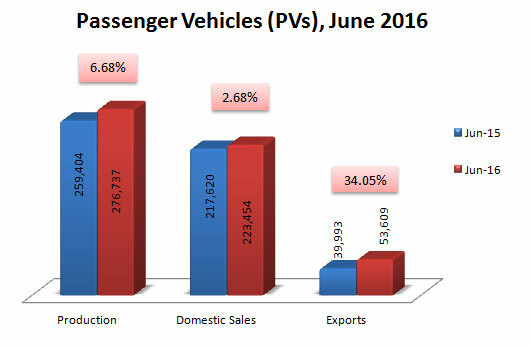 Utility Vehicles however registered a healthy growth of 35.24% and managed to push passenger vehicles segment into a positive growth for June 2016. The total Commercial Vehicles has a positive growth of 5.63% in June 2016 as against the same period last year. Within this segment, the Medium & Heavy Commercial Vehicles (M&HCVs) sub-segment could manage only 1.90% domestic sales growth while the Light Commercial Vehicles (LCVs) segment recorded better growth rate at 8.31%. The Passenger Carriers in LCVs held better sales growth at 9.24% while just managing 0.17% sales growth in M&HCVs. Similarly, sales of Goods Carriers in LCVs grew by 8.12% while in M&HCVs their sales had a moderate growth of 2.31%. 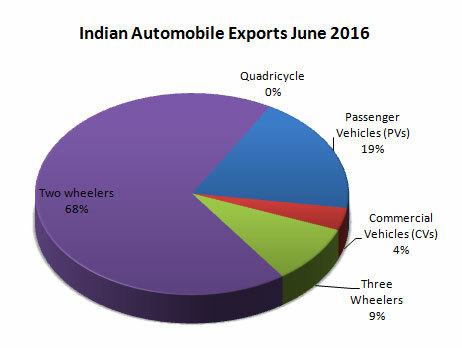 The Three wheelers segment registered a domestic sales growth of 10.22% for the month of June 2016. Within this segment sales of Passenger Carrier registered a growth of 10.41% while Goods Carrier sales had a domestic sales growth of 9.37%. 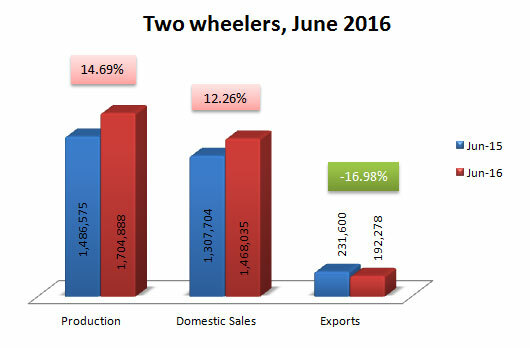 The domestic sales of Two Wheelers as a segment registered the highest growth for the current month at 12.26%. Scooters grew their domestic sales by a handsome 21.32% while Mopeds managed an even better sales growth in the domestic market at 25.79% for the month of June 2016 over the same period last year. 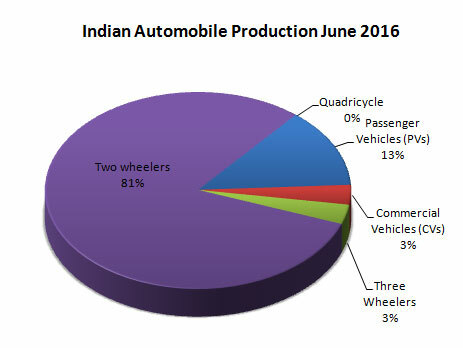 Motorcycles, with an overall good growth at 7.52% was way behind the other two sub-segments of two wheelers for June 2016. 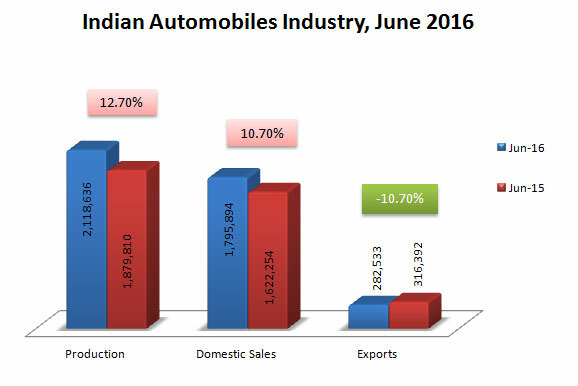 Automobile exports registered a decline despite a healthy growth in passenger vehicles and commercial vehicles for June 2016. The passenger vehicles clocked a 34.05% growth in exports for the current month with utility vehicles registering the highest and most impressive growth of 223.39% for the current month. 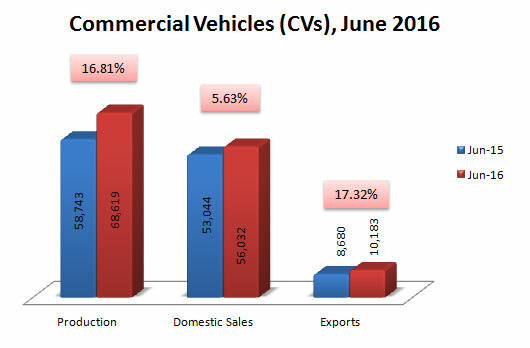 The commercial vehicles also witnessed a growth of 17.32% in June 2016. 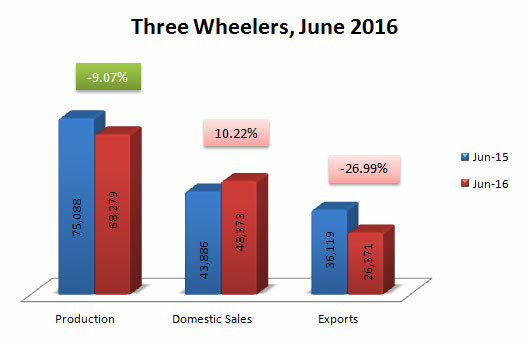 The two wheelers and three wheelers segments, bringing down the overall growth into negative, registered declines of 16.98% and 26.99%, respectively, in exports for June 2016.